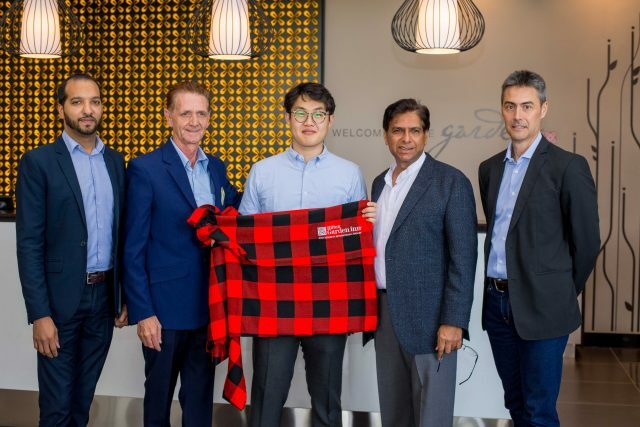 (L-R) Hilton Quality Assurance Manager Amit Bir, Hilton Garden Inn MD Lorenzo Baleri, property owner Ashak Manji, and Engineer Bradley Boulle with the hotel’s first guest Mr. Cho Sungkyu (centre). Hilton Garden Inn has opened its first branded hotel in Kenya on Mombasa, just 2kms from Jomo Kenyatta International Airport (JKIA). The hotel has 175 rooms and amenities such as a Great American Grill, The Pavilion Pantry lounge, gym, heated rooftop pool, free Wi-Fi among others. Rooms starts from Ksh. 8,095 ($80). This is the second Hilton brand to set up in recent months after DoubleTree by Hilton.